Clicking the Add Task menu item from within the project will allow you to add a task using the full task add/edit form. This form can also be accessed by right clicking on the task, hovering on the Edit Task (inline) menu option and selecting the Edit Task (full) sub-menu. Adding a task in this detailed form is made up of up to 6 different tabs but number can vary depending on if there are Custom task fields defined and located in the Custom Fields tab. Note that the Name is the only field with a * by it, which means it is the only required field. However, a major strength of Project Insight is seen in the ways in which it can help you track the interrelationships between tasks, time and people. So, wherever possible, the other fields are recommended for regular use and can be of great value to you in understanding the status of a project as a whole. Allows you to select where within your folder structure, this new task belongs. indicates whether or not this task will be a roll-up task calculation of one or more tasks to be entered, with this task as the Summary Task. Is used to mark a particular point of measure within the project. It displays with a special symbol on a Gantt chart to designate a milestone. Is for a brief description of the task that can serve as a helpful reference whenever a user clicks on the task name to see more detail. Represents the number of days or days plus hours and minutes during which a task will be undertaken. It is recommended that duration values are set based on a number of whole days, leaving hours and minutes blank, in order to avoid complications that can arise when scheduling dependencies with other tasks that are based on whole day durations. Remember that duration is simply the amount of work time that elapses between the start and the finish of the task, regardless of the work (number of hours) that will be applied to the task during that time frame. Think of duration in terms of time on a calendar, as opposed to time on a clock, and this should help to keep duration values simple. Is the number of work hours required to complete the task. This value is used to calculate the resource availability and allocation, as well as the work cost budget. Assigns the task to a specific resource. Click image\down_arrow.gif to see a drop-down menu of resources currently assigned to the project. A resource must be assigned to the project (see Add Resources to Projects) in order to be available from this drop-down selection. Represents the internal hourly cost in dollars of the resource assigned to the task. This field is automatically populated if the resource assigned to the task has a burden rate assigned in the Add Resources to Projects at the time the resource is assigned to the task. This field is used for calculating and tracking actual costs in a task that will have time entered by resources. Is the hourly rate at which the user's work on this task is to be billed to the customer. This field is automatically populated if the resource assigned to the task has a bill rate assigned in the Add Resources to Projects at the time the resource assignment to the task. 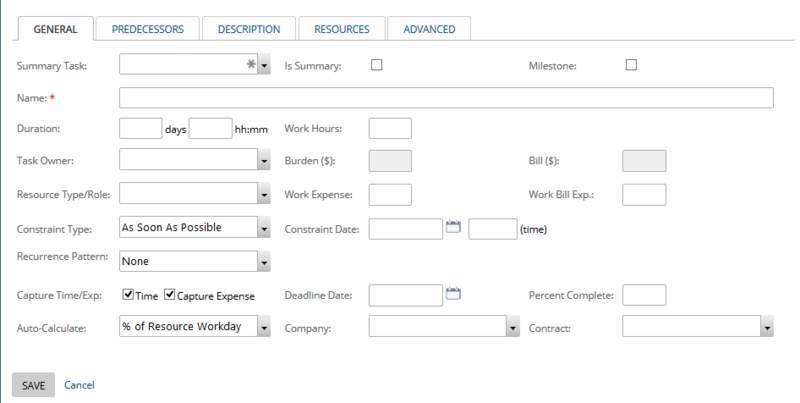 This field is used for calculating and tracking billable costs in a task that will have time entered by resources. Assigns the type of resource (i.e. carpenter, programmer, machinist, graphic artist) to the task. It is used for reporting and to allow a one-to-many assignment of a resource to tasks within the project. Resource Type Explanation. Is any fixed cost of goods associated with the task. This may be the same or may differ from the Est. Fixed Cost. It is important to have a value in this field for any non-labor costs that are expected to display in reports for Work Total Expenses. Is the fixed billable amount for goods associated with the task. This may be the same or may differ from the Prop. Fixed Cost. It is important to have a value in this field for any non-labor billable values that are expected to display in reports for Billable Total Expenses. Defines a rule that must apply to the task schedule. These are additional rules to predecessor/successor relationships and will override date settings that would otherwise be determined by predecessor/successor relationships. Click the drop-down arrow to see a menu of Constraint rules. Further information on constraints is contained in a Constraints. Is the specific date and time value for Constraints that require a manually entered date and time. Constraints requiring a manually entered date are Must Start On, Start No Earlier Than, Start No Later Than, Must Finish On, Finish No Earlier Than and Finish No Later Than. The constraint time, if left blank, will default to either the beginning of the first work day of the task duration for "start" constraints, or the end of the last day of the task duration for "finish" constraints. Allows you to set the task to reoccur, daily, weekly, monthly or yearly. *Note: Recurring Tasks must have a constraint date with a "Must Start On" constraint. Once a Recurrence Pattern is selected the amount of time between occurrences and the range of recurrence must be selected. Further information for recurring tasks is contained within Add Recurring Tasks. Indicates whether or not task owners and resources assigned to the task, as well as project managers on the project, can input time entries and expenses for the task. Represents the date by which the task must be completed. The Deadline Date will not change the duration settings or manipulate the task schedule. Is used to report the progression of work within the task. The percentage of completion will display visually as a solid line through the task line on the Gantt chart. This is calculated dynamically within a summary task based on entries from its child tasks, or is calculated through manual entry on any tasks that are not summary tasks. This field is normally left blank upon entry of a new task, to be updated throughout the course of performing the work. See also Update your Tasks. Will inherit it's value from the Default Calculation. The Auto-Calculation is used when the task's Default Calculation needs to be changed temporarily during the current edit. Once Save or Cancel is clicked the Auto-Calculate will change back to the Default Calculation value. If the task needs to change and stay as a different Default Calculation then the Project Default then the Default Calculation should be changed as well. % of Resource Workday is the default, as it is the most commonly used and the easiest to understand. This calculation allows the project manager to set a schedule based on the duration of the task, while manually entering the total work (hours) to complete the task. The system then automatically calculates the percentage of each of the resources' workdays that will need to be allocated in order to complete the task. Task Duration allows the manual entry of the total work and % of resources' workday. This setting will calculate the duration automatically after the task is submitted. If multiple resources are assigned to the task, the duration will calculate based on the duration for the resource who requires the longest duration to complete the task. The % of resources' workday for all other task resources will adjust in accordance with the duration value calculated above. Is the company to associate with any billing and/or budget reporting for this task. If a Primary Company is associated with the project, the task will automatically report in association with the Primary Company (no Company selection necessary on the task). Company selections for the task are only available based on those selections allowed by association with the Project in the Add Project - General form. References the contract associated with the task. This should always be "No Selection" unless the contract for the task is different than the contract for the project. "No Selection" will dynamically report the contract selected at the project level. Any selection other than "No Selection" will not change at the task level whenever the contract is changed at the project level, even if the task contract selection is the same as the selection for the project. These fields can be added by the project manager for use on the project. Represents the number of hours being proposed for the task to the client or end customer. Sync from Work will use the number you previously placed into the Work Hours field and place it here automatically. This field is relevant only when tracking estimates and costs associated with a project proposal to a customer. Sets the estimated costs for reporting original budget estimates. By using the estimated rate, adjustments can be made to the burden rate for budgetary tracking without losing the rate for which the task was originally estimated. Sets the proposed rate charges for reporting original proposal pricing. By using the proposed rate, adjustments can be made to the bill rate for budgetary adjustments without losing the rate for which the task was originally proposed. Represents the estimated time to complete the task. Sets the proposed time for the task to the client or end customer. Represents the estimated expense to complete the task. Represents the estimated expense for the task to the client or end customer.